The avionics industry has enjoyed phenomenal growth in the past few decades, but why is it that technicians are still struggling with the proper training? The industry sorely needs more technicians, but that’s only one side of the story. Without the means to train them efficiently, their energy and motivation would be wasted. No longer can the industry wait for the universities and trade schools to train technicians on the latest equipment. And taking the time for on-the-job-training severely erodes the bottom line. Let’s see if this sounds familiar. Imagine that a customer arrives in a couple of days with a Citation Jet and he is having problems with the TCAS equipment. It randomly displays an error code and sometimes does not track aircraft that are visually identified. Your technician that intimately knows the TCAS system is on vacation. Other technicians may pull a box once in awhile, but do not have the intimate knowledge necessary for this job. The Citation owner is a good customer and you know he is only in town for a couple days. Now if you only had a way to take one of the other technicians and train him on the TCAS equipment, quickly. There are factory training courses, but they are only given twice a year, at the factory difficult to schedule and very expensive. You can let the technician try the repair, but the extra time needed to learn on the job is just not available. What to do? This scenario is played out many times each month. The solution may be just a little time and few keyboard clicks away, in the form of Computer Based Training. The personal computer has allowed training course developers the means to provide timely training in a quick and easy way. Your technician can either take an on-line course from the Internet, or take a CD-ROM home and learn about the TCAS system on his own computer. Computer Based Training, or just CBT, uses a personal computer or terminal to provide an interactive, structured and self-paced learning environment. 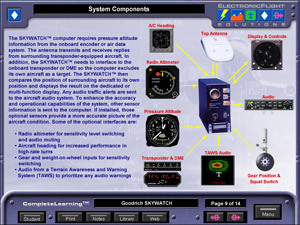 A technician would log on to a computer and proceed step-by-step through the operating principles and maintenance procedures of a specific piece of avionics equipment. Computer Based Training offers many advantages over traditional course delivery. Chief among those advantages are the portability offered by the software and the ability for the technician to control the pace. The software is able to load on multiple computers within the company, therefore virtually making any computer a training device. The portability also allows any technician to take the software home and use their personal computer for the training. Going back to the situation with our Citation customer. If a technician knows that this customer is arriving the next day, the equipment can be reviewed the night before, using the CBT at home or after hours at work. 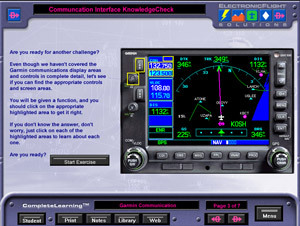 Because the information is fresh, the technician can serve the customer better by having a more complete understanding of the system when the pilot describes the problem. Additionally, the troubleshooting effort is reduced because of the greater familiarity with the equipment. Only CBT offers this kind of scheduling flexibility. Providing the shop manager with the needed just-in-time training. If there is down time for just an hour, the technician can sit with the CBT to refresh knowledge or continue with previous training. Instead of grabbing a broom, down time is much more productive. The CBT provides a focused lesson that is both timely and pertinent. For instance, if a technician is troubleshooting a radio and finds that the problem is traced to an unfamiliar circuit, the technician can quickly review the circuit with the CBT. The menu structure of CBT allows the technician to review just that section and not waste any time searching for the answers. The CBT program is constantly monitoring the technician. If a question is missed, for instance, the program can provide instant feedback of the right or wrong answer. If the topic is important, multiple methods to convey that information are presented. So the technician leaves the CBT with a thorough understanding of the material. CBT has the capability to play animations, 3D fly-through, or videos, thus allowing the course designer options in presenting information in the most efficient manner. Sometimes, trying to explain a concept or procedure with words and still pictures in a paper manual just leaves the technician confused. The multimedia capability of CBT can explain the procedure with animated computer graphics or videos. Thus, the technician gains the perspective from the view of the operator, instead of an abstract view of the component. Keeping any training course updated with all the latest developments has always been a difficult task. Often requiring the replacement of entire volumes of training materials for each small update. Just as maintenance manual updates via the Web are becoming commonplace, updating a CBT just involves logging onto a Web site and downloading the latest software. The upgrade path of CBT is very easy and cost efficient. A CBT course is delivered using three different methods, although to the technician the resultant course content is identical. The first method uses a host computer containing software loaded from a CD-ROM onto its own hard drive. 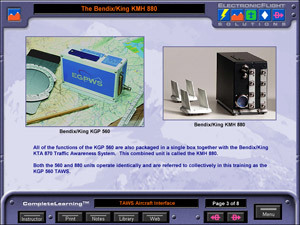 The CD-ROM is portable and allows the CBT course to be loaded onto virtually any personal computer, even on the technician’s home computer. The second method, a Local Area Network, is used within the internal Intranet of a company. As long as a computer terminal is connected to the company Intranet, the CBT course is available anywhere in the facility. These networks have the advantage of using a Learning Management System to track the individual progress of each technician. These systems also provide shop managers with detailed reports on a technician’s progress through the training modules. A real benefit when the FAA stops by to look at the company’s training records. The Internet is the final method of distribution. Technicians log on to a Web site of a university or training company and select from a variety of courses. There are two major benefits of a Web based delivery system, courses are added and updated constantly, and the course can be taken anywhere that provides an Internet connection. Great for a traveling technician. Some web sites even provide a limited Learning Management System to track the progress of employees. Unfortunately, courses over the Internet are limited in the amount of graphics because of the dial-up bandwidth limitation. There are many good CBT courses available on the market for maintenance and pilot training, but very few are focused directly on avionics operation, repair or installation. Producing a CBT course is relatively expensive because the technology is still relatively new and the volume is low. Although in other circles, such as the medical field and on-line universities, CBT is very prominent because the customer market is comparatively much larger than aviation. The military spends millions of dollars on CBT because they are looking for long term efficiency, not a cost benefit. Fortunately, the cost of developing a CBT course is dropping, and more FAA regulations are requiring additional training. The combination of these forces means that more CBT courses dedicated to avionics are on the way. Let’s not forget the install and line technicians. They need training too. And this is the area that the current training needs far outweigh the available training. These are often entry-level positions that require a massive amount of time with the new-hire to bring them up to speed. The industry is sorely aware of the training issues of entry-level technicians. Training in these areas need to concentrate on installation techniques, LRU troubleshooting and certification/airworthiness testing. 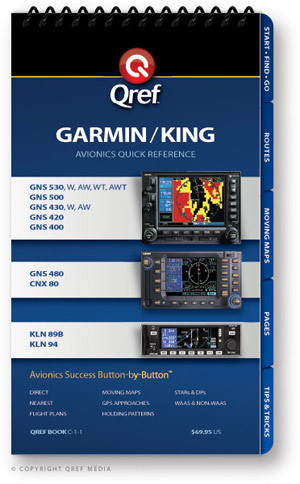 Time is limited in an avionics shop and there are precious few extra days to spend on training. 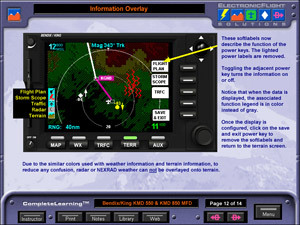 Traditionally, a technician would study the maintenance manual to glean the necessary knowledge, but the maintenance manual is designed to repair the avionics unit and not train the operating concepts or troubleshooting techniques. Some avionics manufacturers, and training specialty companies, provide training either at the factory or in the field, but those courses are often lengthy and can really eat into a schedule and budget. Even if a small mom and pop avionics shop does have the budget, the time required for a course is just not available. This often leads to poorly trained technicians and greatly increased troubleshooting efforts. Additionally, those multiple-week courses often provide too much information in a single sitting. Technicians attending a week-long, or longer, class are often saturated with information. These technicians are used to being constantly on the go around the ramp and hangar. To make them sit still for a week is torture. A point is reached when the donuts and coffee just don’t keep the attention level high enough. A good self-paced CBT allows for progressive training that breaks the topics into sections that are accessed as needed or where the training can be interrupted with actual practice on the real equipment. This leads to greater comprehension because the CBT portion of the training is punctuated with real skill-building practice. Another disadvantage of a week-long factory course involves the many different levels of technician experience. A green technician is often placed in the same class with a veteran. The effect is twofold, the veteran technician may be bored with the slow pace of the course and the green technician may feel overwhelmed and not ask any questions for fear of embarrassment. Even the best of instructors has difficulty accommodating the varying needs of a mixed class. A well designed, self-paced, CBT course is sensitive to the varying levels of experience and accommodates both the green and veteran technicians. Some CBT courses are highly criticized because of the approach taken to the design of the course. They follow the maintenance manuals and are written by the engineers of the equipment, instead of dedicated trainers. This leads to little more than a page turner that describes what the button or component does (restating the specs) instead of how to actually use it. Or the rote approach is taken that just drills procedures without the basic understanding of the principles involved. These page turner CBT courses do not involve the technician with realistic exercises or problem-solving scenarios. Relying on a wealth of information without the necessary skills required for complete understanding. A well designed CBT is able to break down the “spec” training and teach the concepts in an interesting and compelling manner. The initial purchase of a CBT course library may seem expensive at first, but viewed from the longevity and ability to train multiple technicians, the long-term costs are much more reasonable. For the price of sending a single technician to a week-long factory school, an entire library of Computer Based Training material can train many technicians for a few years. Many CBT providers offer complete training packages that include the CBT courses, a Learning Management System that monitors individual technician progress and periodic updates that keep the course information current. These one-stop training solutions offer fixed cost packages with yearly or multiple-year contracts. Eliminating the endless struggle to gain the most training from a limited budget and help with planning the next year’s budget. Although Computer Based Training courses have many advantages, they also have limitations. The hands-on element is vitally needed if a technician is to completely understand the concepts and use the knowledge in the workplace. Relying solely on CBT as a training method should be avoided. A computer can not sufficiently monitor the technician for comprehension. Nor can it sufficiently adjust to any problems that the technician is having with a complex topic. Some CBTs monitor a technician’s response to an exercise or quiz, then reviews the material if necessary, but a total redirection is beyond the software’s capability. This is where the live instructor or mentor is needed. Some people learn much better with the human interaction of an instructor-led classroom environment. The focused and ever changing classroom can direct the training in a different and more specific direction. Focused answers to technician inquiries often provide a much more comprehensive learning environment. Especially when the classroom is full of technicians with varying backgrounds. The experience of other veteran technicians in the class may help the green technician gain a greater insight into their own troubleshooting dilemmas. With each real-life story told in class, or on the coffee break, many of the pieces fall into place. The instructor also gains from the experience of the technicians and adds that knowledge into the next lecture. Thereby constantly improving the course. By nature, technicians enjoy, and need, the hands-on approach to learning about a piece of new equipment. They need to touch it and feel it before the training becomes real. Computer Based Training can only provide a picture or video of the real thing, limiting the technician’s curiosity and comprehension of the material. Fortunately, the delivery of a CBT course can be interrupted with periodic hands-on training under the watchful eye of an instructor or experienced technician. Another limitation of a CBT course is the requirement that a technician be self-motivated. Sitting in front of a computer for any length of time requires concentration and patience. The early CBT courses were little more than page turners that required hours of reading poor resolution computer monitors. 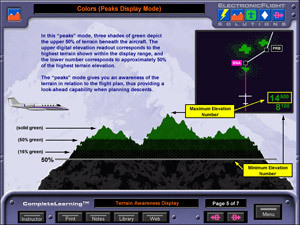 Although, with the advent of inexpensive multimedia computers and advanced development software, the more recent CBTs are more graphical and interactive. Thus attempting to make boring subjects more exciting and compelling. The new training software also provides a tracking mechanism, or bookmark. This allows the technician to leave the training when a break is necessary or on-the-job skill building is necessary. Upon return, the program begins the training where the technician left off. Providing the ability to pace the training to meet the needs of the technician or maintenance facility. People learn in different ways. For instance, some people learn best by touching the equipment, others by hearing about it. A CBT course is limited in presenting different learning styles. The course designers are aware of the different learning styles and try to accommodate as many styles as possible, but there are always compromises. Customizing to each user’s style is difficult, because upon entering the course, the program must determine the particular learning style through a series of questions and exercises. Then once the learning style is determined, customize the course to that user’s style. Not an easy task with all the nuances of human behavior. This technique, although very feasible, involves an extraordinary amount of development resources. Therefore, to keep development costs within reason, the course developer often strikes the best compromise between teaching styles. Sometimes people learn better when they are immersed into the training. Many flight academy schools subscribe to this technique and actually provide the most expedient method to quickly absorb a great amount of information. A lonely hotel room is very favorable to this method of training a total immersion into the task at hand. A computer-based course taken at home often has too many distractions, with the family, kids and dog. Only a dedicated technician can channel away those distractions and concentrate on a computer course. A dedicated home office with a locked door is the only answer. Work may be a little more conducive, but not much better, because the technician may get pulled from the training too easily for that last-minute rush job. A dedicated room and time needs to be allocated, and everybody must understand to not disturb the technician. Large maintenance facilities often have dedicated training rooms for this purpose, but the smaller shop does not have this luxury. There is no question that Computer Based Training has advantages over traditional classrooms, but conversely, classrooms have advantages over the Computer Based Training. To combine the advantages of each, a multi tiered approach is able to use a hands-on reinforcement of basic knowledge learned from the CBT. The CBT course is initially completed, with on-the-job interjections of actual hands-on practice. Thus, a good foundation of the basic overall knowledge and lingo is absorbed, which is then reinforced by physical practice on the actual equipment. A CBT course is just a tool used to present training material. The intent is not to replace good instruction. The human and physical element is still needed to complete the training. But, the way of the future is Computer Based Training. It’s easier to schedule, more accommodating and a little bit fun!